Albert James, Lucy Ann and Bernard William Joseph Burns. Lucy and James Napoleon Kersley had nine children born in either Melbourne or St Arnaud between 1885 and 1906: Mary (1885-85), Ellen Maude (1886-1942), Albert James (1889-1965), Thomas Roy (1892-1972), John Charles (1895-1951), Mary Veronica (1899-99), Veronica Mary (1901-41), Bernard William Joseph (1911-88) and Doreen Monica ('Mona') Burns (1906-1972). As shown, two of these died as infants. The remainder survived childhood, married and had families of their own. Together they have provided Lucy and James with 14 grandchildren we know of and at least 31 great grandchildren, 46 great great grandchildren and 6 great, great, great grandchildren. Their eldest daughter, Maude (pictured on the left), was born in Melbourne in 1886 but grew up in St Arnaud. She returned with her parents and siblings to Melbourne where she married Victor Gladstone Duncan (1886-1948), the son of William and Emma Duncan, in 1916. Click here to view a photograph of their wedding and another photo of Maude before she was married. 1) Victor James Duncan (1920-90). The DVA Nominal Service Roll shows that 14996 Cpl Victor James Duncan, born in Melbourne on 11 May 1920, enlisted in the RAAF at Sydney on 6 May 1940. He was then living at Leichhardt in Sydney and his NOK was Victor Duncan. He served in NOR H/Q until his discharge on 29 April 1946. 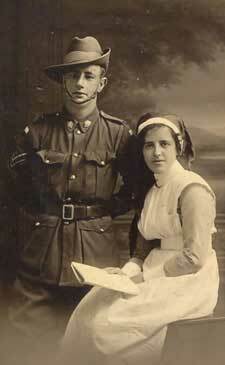 The year before his discharge he married Margaret Kelly at Wagga Wagga in southern NSW. After the war Victor, who worked, as a taxi driver, and Margaret lived in the inner Sydney suburb of Balmain (44 Mort Street). He and Margaret had four children in New South Wales - Jennifer Margaret, Roslyn Megan, Gregory James and Michael Hartley Duncan - and both died there, Victor in 1990 and Margaret in 1994 (probably at Bowraville although that has not been confirmed). 2) Mary Veronica ('Monie') Duncan (1917-2005). 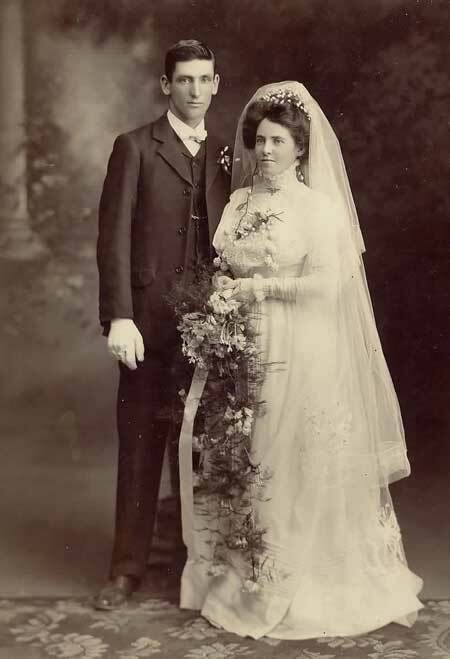 Born at Burnley in Melbourne, Monie was twice married, first to John Simpson at Preston in 1938 (see their wedding photo below) and, following John's death at Cobram in 1991, to Edward Cann at Sawtell in New South Wales in 1995. The Australian electoral rolls show that Monie and John, who worked as a motor driver and carrier, lived at Preston immediately after their marriage and later in the nearby suburb of Reservoir. They had three children: 1) Valerie Mary Simpson who married Neville McFadyen at Preston in 1959, lived in Bulleen and had three children; 2) Malcolm John Simpson who married Linda May Massey at Rosanna, lived at Doncaster and had three children; and 3) Yvonne Monica Simpson who married Gary Freeman at Reservoir in 1970, lived at Gainsborough and had at least two children. The Ryerson Index shows that Monie died in the Cobram Hospital on 1 August 2005 (Melbourne Herald, 3/4 August 2005). A few years before her death, my father's cousin, Thelma Ryan, and I visited Monie at her home in Cobram and talked to her about her life and times and family. She had in her small home a large trunk that was packed with mementoes of various kinds as well as a number of family photos which she kindly allowed me to copy. The newspaper notice cited above tells us that at the time of her death, Monie had been not only an 'ever-loving mother' to her three children, but also a devoted grandmother of eight and great grandmother of 17. Veronica Mary ('Vera') Rosenfeldt nee Burns and Fred Lindsay. We have yet to discover where James and Lucy's oldest son, Albert James Burns, was born. Like his sister Maude, he grew up in St Arnard and moved with his parents and siblings to Melbourne where he worked for the Victorian railways. In 1917 he married Ruby Victoria Bettles (1894-1965). The 'Bell-Saker Family History Site' and 'Bettles Family Tree' on Ancestry tell us that Ruby was born at Bright in Victoria and died at Clifton Hill in Melbourne. Her parents were Walter Warren Bettles (1859-1904) and Margaret Frances Bibby (1865-1943). 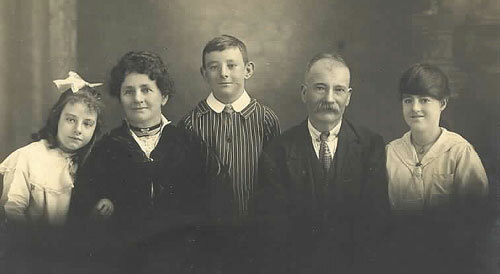 Ruby and her mother and siblings are pictured in the photo on the left which is thought to have been taken in around 1911, seven years after her father was tragically killed in a mine accident at Bright. Those pictured are (from L/R): Ruby, John, Annie ('Ronnie'), Margaret (Ruby's mother), Janet ('Cissy'), Arthur and Letitia ('Tish'). Ruby's mother died in Melbourne in 1943 and the following notices were placed in the Argus: 'BETTLES - On October 3, Margaret Frances Bettles of 34 Esplanade Clifton Hill, beloved wife of the late Walter and loving mother of John, Cissy (Mrs Stoker), Tish (Mrs Hill), Arthur, Ronnie (Mrs Mann) and Ruby (Mrs Burns)'; and 'BETTLES - On October 3, Margaret Frances Bettles, loving nana of Jack, Jimmie and Margaret Burns, Winnie, Ursula, Pat and Ann Mann, Enis and Wally Stoker, and Wallie, Bob and Monnie Peters; and great grandmother of Margaret Peters'. John Robinson ('Jack') Burns (1918-95) was working as a 'core maker' and living at his parents at Clifton Hill at the time of the 1942 election. Two years later he married a local girl, Jean Lillian Alger (1921-99). Although still to be conformed, we believe Jean's parents were William Edward Alger and Theresa Elsie Newell who were married in Victoria in 1919. After their marriage Jack and Jean lived first at Clifton Hill, then Moorabbin, Clayton and Cheltenham before, from the mid-1970s, moving to Mount Martha near Frankston. During this time Jack worked as a clerk and a newsagent. The Billion Graves website shows that Jack died in 1995 and Jean four years later, they are buried together in the Mornington Cemetery at Mount Martha and they had four daughters: Jennifer, Judith, Christine and Margaret Burns. James Gerard Burns (1925-2011) worked as a turner and married Helen Mary Hunter (1933-2008). The Australian electoral rolls show they lived with James' parents at Clifton Hill until the mid-1960s when they moved to Forest Hill (James was then described as an engineer). Their respective death notices published in the Herald Sun on 12 November 2008 and 23 August 2011, shows Helen died in the Ringwood Private Hospital and James in the Knox Private Hospital, they had on daughter, Fiona Margaret Burns, and four grandchildren: Richard (deceased), Felicity, Courtney and Kathryn. 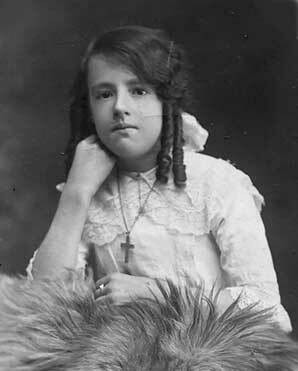 and Ruby Victoria Marie Bettles who were married at Melbourne in 1917. Thomas Roy Burns was born at St Arnaud and seems to have worked all his life for the Victorian Railways. His military records held in the Australian Archives show that he enlisted in the First AIF on 18 August 1914. He was attested at Broadmeadows in Melbourne and assigned to H Company of the 8th Infantry Battalion. He embarked from Melbourne on the HMAT Benalla on 19 October 1914 and served with his battalion at Gallipoli, where he was wounded and hospitalised at Malta for a time. From January 1916 he was with his battalion in France and Belgium. Over all this time both he and his brother, John Burns (see below), corresponded with their Laurence cousins in Narrandera. In one card, posted to 'his dear old Kit' (Catherine Laurence) from Egypt on 2 March 1915, he apologised for not having had his photo taken and added it was now unlikely he would get a chance to do so. This was because he was about to go into action at Gallipoli. He could not tell her this of course because such information would have been censored. So he approached the topic obliquely saying simply that 'the papers will have told you all about us before this reaches you'. The following year he wrote, from 'the trenches in Flanders', that they had just fired their first shot in France although, perhaps to allay any concerns Kit may have had for his safety, added 'where we are is extremely quiet and you would not know a war was on only for the artillery which is going day and night'. On 24 February 1917 Roy, who had been promoted to Cpl on 25 November the previous year, was accidently injured while helping prepare an outpost in front of the battalion line. He was subsequently admitted to Graylingswell Hospital in England and, following a Board of Enquiry, declared unfit for active duty. He was repatriated to Australia on 30 January 1918 suffering from general nervous debility and was discharged from the Army in Melbourne on 30 April 1918. While in England Roy met and married, in the Chichester registration district of Sussex in 1917, Hannah May Morgan (shown with Roy in the photo on the right, which was taken in England sometime after he had been promoted). 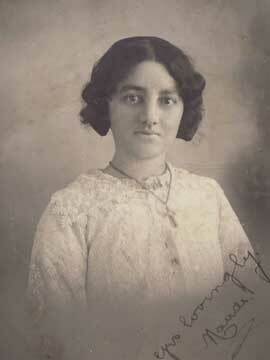 According to the 'Daniels Family Tree' on Ancestry.com, Hannah was born in Breconshire in Wales in 1897. Her parents were said to be Owen Morgan and Mary Jones. The Assisted and Unassisted Passenger Lists to Victoria, 1839-1923 show that Hannah, then aged 22 years, sailed from Plymouth on the Patria and arrived at Melbourne in October 1918. 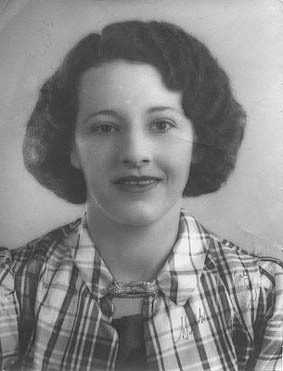 She and Roy lived in Melbourne after the war, initially with Roy's parents and later at 119 Beaconsfield Parade in Northcote where they would live for the remainder of their lives. Both Roy and his two sons, Patrick Owen and Thomas James Burns, served in the Australian Army during the Second World war (see the details and photo below). Click here to see a further photo of Roy and May Burns nee Morgan. Patrick Owen Burns (1921-2003). Born at Northcote in 1920, Patrick served in the Second AIF in the 2/2 Field Regiment RAA, enlisting at Caulfield in Melbourne on 29 May 1940. He was discharged on 29 October 1945 having attained the rank of corporal. In 1948 he married Evelyn Joyce Davidson the daughter of Robert Davidson (1886-1950) and Myrtle Ruth Firmer (1886-1976) from Shepparton. 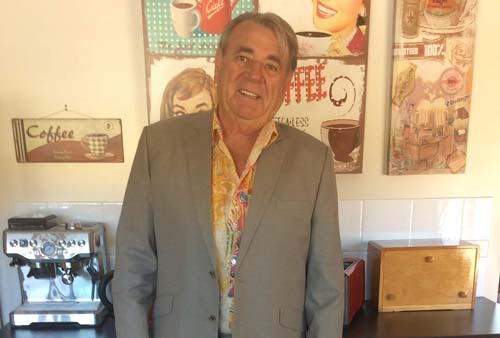 The Australian electoral rolls show Patrick, who worked for the Victorian Railways, and Evelyn living initially at Red Cliffs near Mildura in northern Victoria before moving to 29 Harmer Street in Northcote. Patrick died at Heidelberg in 2003. According to the 'Daniels Family Tree' on Ancestry he and Joyce had three children. Thomas James Burns (1922-99). Born in Melbourne in 1922, Thomas enlisted in the Australian Army in January 1941 and served as a private soldier in the 4th Anti-Aircraft Battery before transferring into the Second AIF in May 1941 where he served as a driver in the 2/12 Field regiment until his discharge on 15 November 1945. After the war he married Marjorie Gladys Theresa Cheney (1928-2012) who we believe came from New South Wales. Thomas and Marjorie lived all their married life at 40 Southernhay Street in the Melbourne suburb of East Reservoir. According to the 'Daniels Family Tree' on Ancestry and other sources they had six children: John Roy, Carolyn Theresa, Pamela May, Gaylia Ann, Stanley Raymond and Warren Burns. An on-line guest book maintained for the family by the Melbourne Herald Sun at , tells us that Marjorie died on Anzac day in 2012 and her husband Thomas and daughter Gaylia had pre-deceased her (we believe that Gaylia Ann Burns (1963-2010) had been twice married, first to Mark Anthony Frost and second to Andrew Zablocki with whom she had three children). The same source indicates that Marjorie and Thomas then had at least 14 grandchildren and six great grandchildren. Margaret Mary ('Peggy') Burns (1928-93). Pictured on the right, Peggy was living with her widowed father at 119 Beaconsfield Parade in Northcote at the time of the 1949 elections. Two years later she married Marshall Joseph Hayes (1929-88), youngest son of Mrs A. Hayes of Parkdale. The electoral rolls show that after their marriage they lived at 119 Beaconsfield Parade until at least 1980. Margaret worked as a stenographer and Marshall as a buyer. We believe they had no children. Marie Bernadette Burns married Robson Victor ('Robbie') Batt (1926-2014), a driver and milk carrier, and had three children: Trevor Michael Batt (1962-2012) and two others. who all served in uniform during the Second World War. 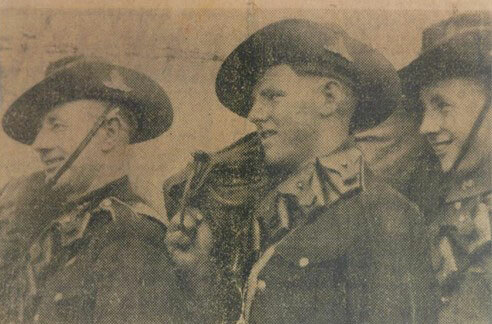 His military records in the Australian Archives show that John (pictured on the left) was born at St Arnaud and worked initially as a builder's labourer. He enlisted in the First AIF on 20 August 1914 and was allocated to B Coy, 6 Infantry Battalion. He left Australia on 21 October 1914 and underwent training at Egypt (see the photo below) before landing at Gallipoli. In a letter posted from the Mena Camp in Egypt on 26 March 1915, John told his cousin Kit how he had visited the pyramids and other ruined temples around Cairo. He added that although 'there are some very bad places here ... anything you read in the papers about the Australian troops are simply bosh and you don't want to take any notice of anything you might hear. There is a Captain Bean in the 5th Batt that wrote home to the papers and gave us a fearful name. They are giving him a devil of a time now'. More outgoing than his brother Roy, John ended his letter with 'best love to all and everybody' and 'a lot of fat kisses from Egypt, not Egyptian ones though'. Like Roy John later served on the battlefields of France where, as had happened at Gallipoli, he suffered from various illnesses and ailments which sometimes landed him in hospital. On 29 September 1916 he was promoted 'in the field' to L/Cpl but was reduced to the the rank of private a month later after failing to attend a parade. He was promoted again in May 1918 and wounded in action in June the same year. After being promoted to Cpl, he was wounded a second time, on 23 August 1918, from a gunshot wound to the groin and invalided back to England where he was admitted into the 4th London General Hospital at Denmark Hill in S.E. London. He returned to Australia on 3 December 1918 under the special leave provisions awarded to 1914 enlistees and discharged in Melbourne on 28 March 1919. In 1922 he applied for a grant under the War Services Homes Act. The 1924 electoral roll shows him living with his parents at 21 Holden Street North Fitzroy. It seems that he was married sometime after this for the 1936/7 and 1942 electoral rolls show him and an Alice Winifred Burns living at 40 Southernhay Street in Preston where John was said to be working as a fitter. Ancestry's index of Australian bdms shows that an Alice Winifred Burns, the 50 year-old daughter of George McPhee and Catherine Riordan, died at Reservoir in Melbourne in 1947 (the index further shows that George McPhee, son of Peter, married Kate Riordan at Adelaide on 21 November 1881, and their daughter, Alice Winifred McPhee, was born at Goodwood in Adelaide on 23 June 1894). The following notice in the Adelaide Advertiser showed that Alice's father died when she was only four years old: 'McPHEE - On 10 October, George the beloved husband of Katherine McPhee, of Hampton Street Goodwood, leaving a wife and six children to mourn their loss, aged 40 years'. Her mother lived at Goodwood all her life, dying there in 1935: 'MCPHEE - on 26 April, at her residence, 6 Leader Street Goodwood, Kate, widow of George McPhee, aged 75 years'. John continued to live at 40 Southernhay Street after Alice's death (the electoral rolls show his nephew Thomas James Burns, son of Roy Thomas Burns and Hannah Morgan, and Thomas' wife Marjorie were living with John in 1949). As the following death notice in the Melbourne Argusinforms us, he died in 1951: 'BURNS. On March 24 at Heidelberg Military Hospital. 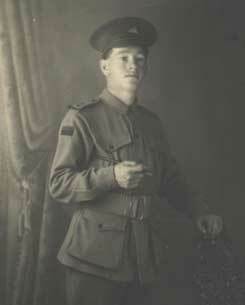 John Charles Burns, No 173 B Coy 4th Battn AIF. Formerly 40 Southernhay Street, Preston. Beloved son of Lucy and the late James Burns of St Arnaud, beloved husband of the late Alice and brother of Maude (Mrs Duncan deceased), Vera (Mrs Rosenfeldt deceased), Albert, Roy, William and Doreen'. We don't think that he and Alice had any children. was taken in Egypt prior to the boys' units landing at Gallipoli in 1915. 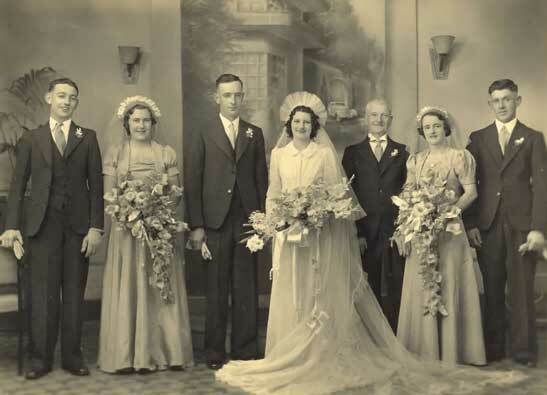 Pictured below on the left as a young person, Veronica was born at St Arnaud but grew up in Melbourne where she married Ernest Frederick Gustave Rosenfeldt (1898-1965) at North Fitroy's Catholic Church on 22 September 1923. Their wedding certificate shows that Ernest was then a 25 year-old plumber who was living at 86 Herbert Street in Northcote (the suburb where he was born). His parents were Julius Rosenfeldt (a deceased tailor) and Ernestine Lober. 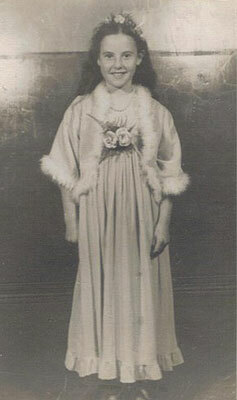 Veronica was then a 22 year-old tobacco worker and living with her parents at 21 Holden Street North Fitroy. The wedding was witnessed by Veronica's brother John Charles Burns. The Australian Archives shows that a Julius Rosenfeldt, a 54 year-old tailor of 224 Wellington Street Collingwood, became a naturalised Australian citizen on 15 November 1902. He was born in Germany in 1848 and had come to Victoria on the 'Arawatta' which had sailed from from Port Chalmers in New Zealand and arrived at Melbourne on 20 January 1881. According to the 'Knoll-Jackel Australian Biography History Project' on Ancestry, he married Ernestine Johanne Wilhelmine Lober (1859-1934) in Melbourne the following year and had seven children in addition to Ernest: Ferdinand Ernest Arthur (1883-83), Julius Ferdinand Alfred jnr (1884-1949), Elsie May (1886-1956), Helena Wilhelmine, Otto Ernst (1891-1924), Louise Hope (1895-1931) and Christiane Gertrude Mabel Wilhelmine Rosenfeldt. The 1931 and 1936/7 electoral rolls show Veronica and 'Ernest Frederick George Rosenfeldt', a plumber, living at 52 Erin Street in Preston. Veronica died at Fairfield in Melbourne in 1941. The 1942 electoral roll has Ernest still living at 52 Erin Street. Although still to be confirmed, we think he re-married for the 1949, 1954 and 1963 rolls show him living on Erin Street together with a Clarice Alice Rosenfeldt. Ernest died at Preston in 1965. Veronica and Ernest had a son, Vernon Kevin Rosenfeldt, who was born at Preston in 1928, trained as a plumber and lived with his parents and later widowed father until he married Audrey Polglaze (1930-2018) at Preston in 1952. The 1954 electoral roll shows Vernon and Audrey living at 27 Austral Avenue in Preston. During the 1960s and 1970s they were living at 170 Rosanna Road in Heidelberg with their two daughters: Debra Maree and Anne Helen Rosenfeldt. On 30 January 2018 Audrey 'passed away peacefully at home in the comfort of her loving family, Vern, Debra, Anne, Dennis, Rebecca and Brendan' (Melbourne Herald Sun, 1 February 2018). Veronica Mary and Doreen Monica ('Mona') Burns. According to Melanie Burns' family tree on Rootsweb, Bernard or 'Bernie' as he was known was born at St Arnaud but grew up in Melbourne where he married Amelia Couch (1911-88) at the Sacred Heart Catholic Church in Preston in 1941. 'My Extensive Family Trees' on Ancestry tells us that Bernard, who worked as a labourer, and Amelia had two children: Terrence and Kevin Burns. It adds that Amelia Couch was born at Brunswick in Melbourne in 1911 and died at nearby Coburg in 1988, her parents were Frank Stobie Couch (1890-1966) and Grace Carrigan (1891-1968). She had previously been married to William Oswald Forde with whom she had four children, all still living. Although still to be confirmed, it seems that Bernard and Amelia may have separated sometime after their marriage. Bernard died at Fitzroy in 1960. Anzac Day in St Arnaud in honour of Jack and Roy, brothers of my father Bill'. Born at St Arnaud, Lucy and James' youngest daughter, Mona Burns married William Narrandera Jones (1893-1956) at the Sydney registration Office on 12 November 1935. Their wedding certificate shows that William, who was 'Theatrically known as William Ellerston', was born at Narrandera in 1893, the son of William Jones, a deceased brewer, and Amelia Alethia Ferrier. At the time of the marriage, William, who was an accountant, was living at 1 Wentworth Street in the Sydney suburb of Manly. Doreen was working as a typist and living at 206 Victoria Street Darlinghurst in Sydney. She was born at St Arnaud in Victoria, the 29 year-old daughter of James Napoleon Burns, a retired storekeeper, and Lucy Kersley. The marriage was witnessed by a W. W. Jones and a Francis Ryan. According to the 'Dixon Family Tree' on Ancestry.com, William's parents were married in Sydney in 1894 and had four children in addition to William jnr: Amelia A. Jnoes (1885-1967), Gwenleon Salter Jones (1887-1907), Mabel Ferrier Jones (1890-1968) and Herbert Stanley Jones (1891-1949). Bill Gammage's history of the Narrandera Shire tells us that William Jones snr acquired the Narrandera Brewery and Cordial Works in around 1882. In 1888 he amalgamated it with the Oakbank Brewery which had been purchased by his brother-in-law, R. H. Ferrier, two years earlier. Jones died from typhoid in 1902 but the amalgamated brewery prospered until it was sold in 1924 to the Sydney-based Tooths who closed it down. William Jones' widow, Amelia, left Narrandera soon after her husband's death and took up residence in the Sydney suburb of Manly where she died in 1952 (she was survived by her son William and two daughters Amy and Mabel). IN BANKRUPTCY PUBLIC EXAMINATIONS Re William Narrandera Jones (known as William Ellerston). Bankrupt's estate was sequestrated on February 22, 1937, on petition. According to his statement of affairs, assets were nil and liabilities amounted to �308. The latter included �286, amount of a judgement and costs. At one time, he stated, he was on the stage and in 1929 began business as an estate agent and business broker in Melbourne, from which his income was up to 10 pound a week. He gave up this business because of ill-health, and in 1934 became managing director of Household Wisdom Ltd [proprietors and publishers of Journals, magazines etc], in which he lost �300. Replying to further questions from Mr Burns (for the Official Receiver), bankrupt stated that in 1934 he came to Sydney, and in 1935 he again entered into business as estate agent and broker. During the next twelve months he had a succession of partners, until R. D. parker, the petitioning creditor, bought a half-share for �250. Subsequently Parker wished to get out, and got judgement against bankrupt for his share of the partnership. The business was closed down in November 1936, owing to lack of capital. Sydney Morning Herald (11 May 1937). The 1949 electoral roll shows Doreen and William, a realtor, living at 115 Macleay Street in Darlinghurst in Sydney. In 1951 William was fined �100 for receiving rent over and above that deemed fair by the Fair Rents Board. At the time of the 1954 election, William and Doreen were registered as living at 304 Victoria Street Darlinghurst, where William died two years later (he was cremated at the Eastern Suburbs Crematorium). Doreen was still registered as living there in 1958. She married Frederick Raymond Stewart sometime between 1958 and 1963 when they were both registered as living at 483 Old South Head Road in Rose Bay. The NSW index of bdms show that a Doreen Monica Stewart, daughter of James Napoleon and Lucy Burns, died in the Manly district of NSW in 1972. This is confirmed by the Ryerson Index which tells us that Doreen, 'formerly of Allambie Heights' died at Manly on 4 August 1972 (SMH 7 August)'. In an e-mail sent to us in 2003, Trish Forbes told us that Mona gave birth to her father, Ernest Kevin, in 1923. We don't know if Mona was married at that stage as there is no mention of a name other than Ellerston-Jones as my father's last name ... the date of Mona and William Narrandera Ellerston-Jones' marriage was 1935 so there may be an adoption (by Bill Ellerston-Jones) somewhere along the way and possibly a first marriage. Ernest Kevin Ellerston-Jones married Winifred Clare Slatter in 1943. They had a daughter, Christine. The marriage ended soon afterwards and Kevin went to Canada. He married my mother, Joan Pamela Stein (an Australian) and produced: Paul Mark Bentley (1955), Patricia Joan Lynette (1956), Philip John Gregory (1958) and Sies Wilto (1959). There are ten children between the four of us. Dad was killed in a plane crash in 1963 and Mum brought us all back to Australia ... There was some animosity between my mother and Mona when Mum returned to Sydney from Canada. We saw Grandma Ray (as we knew her) and stayed at her place in Manly a couple of times but then the contact was severed. Like Trish we have not yet been able to confirm whether Ernest was Mona's son or who his father was. We have found a few other snippets of information about him. The Australian Archives shows that NX112255 Ernest Kevin Ellerston-Jones, born in Melbourne on 17 August 1923, enlisted in the Australian Armed Forces at Frenchs Forest in Sydney on 10 September 1942. His NOK was William Ellerston-Jones. The Department of Veterans Affairs veterans database tells us he initially served as a private soldier in the 17 Aust Infantry Battalion. He was discharged from the Army on 8 March 1943 and transferred into the RAAF where he served as a Sergeant at 7 Service Flying Training School at Deniliquin until 8 February 1945 when he was discharged. The NSW Index of bdms shows that Ernest Kevin Ellerston-Jones and Winifred Clare Slatter were married in the Manly registration district of Sydney in 1943. The 1949 electoral roll has Ernest living at 3 Coonana, Bayswater Avenue Darlinghurst and working in advertising. The divorce notices in the 5 October 1950 edition of the Sydney Morning Herald included W. C. Ellerston-Jones v. E. K. Ellerston-Jones. Doreen Monica ('Mona'), Bernard William Joseph ('Bernie') and Veronica Mary. More photos of the Burns family can be viewed here and here. Maude Burns, from collection held by Barbara Moore. Monie Simpson's wedding and Doreen Monica Burns, from 'Monie's trunk' collection. 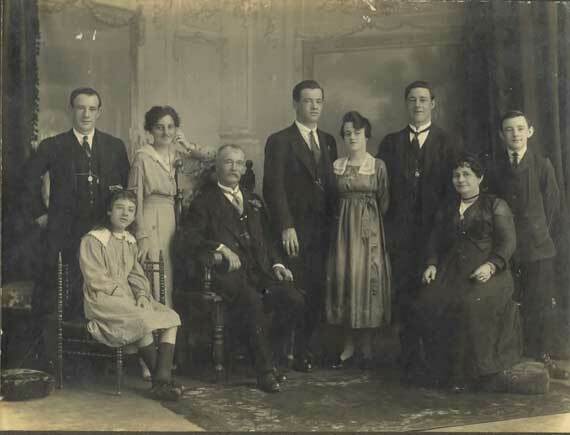 Ruby Bettles' family, from the 'Bettles family Tree' on Ancestry.com. 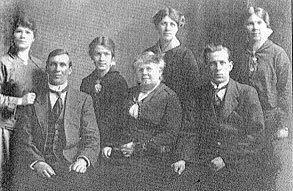 Roy Burns and sons and Margaret Mary 'Peggy' Burns, from 'Burns/Davidson Family Tree' on Ancestry.com.